A single rail serves as a track for passenger or freight vehicles. In most cases rail is elevated, but monorails can also run at grade, below grade or in subway tunnels. Vehicles are either suspended from or straddle a narrow guideway. Monorail vehicles are wider than the guideway that supports them. Hitachi, a Japanese company that's built monorails from Tokyo to Osaka, builds full-size trains that are heavy and bulky. 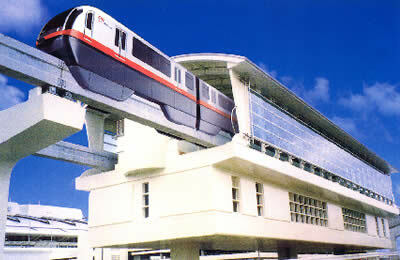 Okinawa monorail was inaugurated in 2003 the 13.1km line. The train run at speed 60km/h with the operation style ATP one man.